Fished today with Jim for a full day fishing charter. 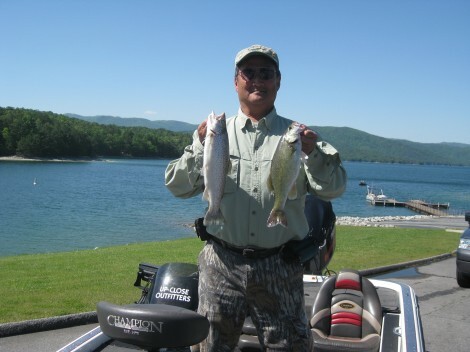 Started on the main lake where the toxaway and Whitewater meet fishing humps and points with trees. No fish caught for the first hour. Switched to bass and caught 2 with a few other bites on a spinner bait burned near the surface on windy secondary points. Found the fish 1/2 way up devels fork. Ran trout agian after the bite died. Managed 7-8 trout at the mouth of Horsepasture and Bear Camp Creek. No bites came on spoons. All fish were caught on jointed Rapalla trout and shad immitations. Some fish were caught on Strike King series 3 crankbaits in KVD shad patterns. 5 of seven bites came on top with a few at 20-25 feet off downriggers. Once again poping the baits out of the clips and jigging produced several strikes. One fish was a keeper. Tip: With the cold front that moved trough the day before, the bass eased out of the beddin areas and were staging on the first points available. They never move far from the bedding areas when these fronts hit. Well I go through your blog and find it interesting…Its fun in doing fishing..